As the global market for ICT continues to evolve towards outsourced software engineering, offshore systems design and integrated IT systems, Serbia is well-placed both geographically and structurally to provide a cost-effective, reliable alternative to more established markets. Key competitive factors which influence international companies to expand their business operations in to Serbia include an outstanding pool of intellectual talent, attractive labour costs, excellent communications networks and a highly skilled workforce with an advanced proficiency in English. Serbia is becoming one of Europe’s most attractive IT hot spots. Over the past few years, the development and promotion of IT services (such as mobile internet technologies and applications development, outsourcing and data transfers) has increased significantly. The number of economic entities using and dealing with IT in Serbia is also growing at a significant rate. IT companies from Serbia are mainly engaged with global firms in the outsourcing of software development, testing software and designing websites, but also providing solutions in the embedded software industry. The main markets for IT services and outsourcing include Germany, USA, Great Britain and the Netherlands. 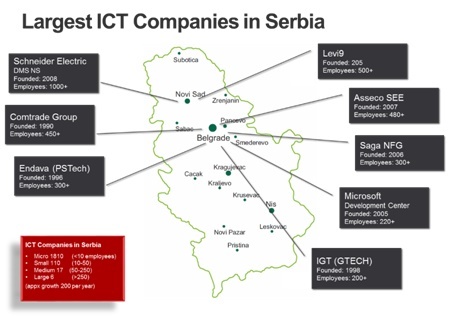 Serbia’s ICT sector has partnered with leading IT companies across the world in order to provide first class solutions to domestic and international clients. Serbian ICT companies range from software engineering businesses and telecommunications providers to world-class system integrators and fast-growing mobile and social-media application developers. Universities and colleges in Serbia produce around 53 000 graduates annually, with one third of students graduating from technical universities. Serbia’s national education curriculum has a strong focus on technical sciences and STEM subjects including mathematics, physics, and computer science. Serbia’s Mathematical Grammar (MG) School (http://mg.edu.rs/en) in Belgrade exemplifies this practice by offering highly specialised teaching in students’ areas of interest. The MG school is accredited with the High National Distinction status and has won over 400 medals and awards from international competitions since its establishment and ranks number one at the International Science Olympiads – a remarkable and superior accomplishment among the top schools in the world. 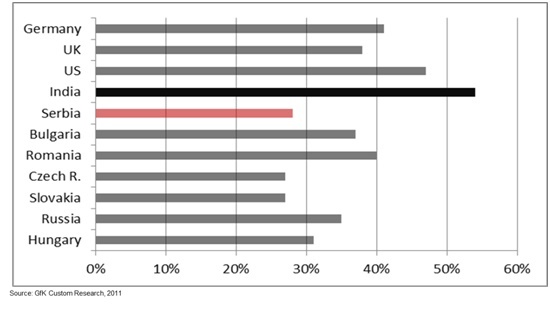 English language proficiency is particularly strong in Serbia. In 2012, Serbia was ranked fourth out of 76 reviewed countries in Business English proficiency by the Business English Index (BEI). Foreign languages are taught from elementary school and throughout students’ entire education. Serbian school children begin learning English at the age of 9 or 10, while a second language (French, German, Italian or Russian) is introduced at the fifth grade. Serbia is home to more than 2,000 innovative ICT Companies employing more than 14,000 people, with expertise in customised high-end IT development services including software development, hardware and solutions. Microsoft opened up its fourth development centre in Serbia which has evolved over time in to an innovation hub. A number of other international companies have also established their development centres in Serbia or utilise outsourcing services from a Serbian IT company including: SKF Group, Adobe, Oracle, Google, Hewlett Packard, SAP, IBM, Siemens, Intel, Cisco, NCR and Erickson. Established in 1996, GCOMM is a multi-award winning Australian technology company, specialising in the delivery of connectivity, cloud and managed IT services to medium and large businesses with multiple office locations. GCOMM is outsourcing to Serbia the administration of CRM and marketing automation platforms and also some research and sales support functions. Established in 2011, Global IT Factory is an Australian IT services company specialising in the provision of leading edge, cost effective Digital IT Services, with a focus on Software Development of Mobility/Web/Cloud and IoT digital solutions. Through leveraging offshore delivery teams based in Serbia who work in collaboration with experienced local teams, Global IT Factory brings offshoring cost efficiency to Start-ups, Small-to-Medium Enterprises and Large organisations. SCAN is a platform for cooperation among various cluster organisations in Serbia, and supports the creation of new cluster initiatives and their development. VOICT coordinates IT systems integration with the best ICT companies in Serbia. Most of VOICT’s business is tied to foreign markets – over 90% of it – in EU, North America and the Middle East. ICT Cluster of Central Serbia – (http://www.ict-cs.org ) is a business association which gathers enterprises, institutions and organisations from ICT sectors from the territory of Central Serbia, in the city of Kragujevac. The cluster was established on May 21, 2013 with the goal to support and develop the information and communication technologies sector in this territory. The Ni CAT is a cluster initiative that comprises 29 local companies, two scientific research institutions (Faculty of Electronic Engineering and Faculty of Mechanical Engineering-University of Niš) and three economic development support institutions (Regional Development Agency RRA JUG, Regional Chamber of Commerce and Business Incubator Nis). SEE ICT is a non-profit organisation established in Belgrade in 2010 with the aim of contributing to the development of the information society in Serbia, believing that new technologies can improve all aspects of social life – the economy, education, culture and health.